How to Assemble A Rigid Bench Top Drill Press? The importance of a drill press is best realized when it comes to drilling holes with absolute accuracy and perfection. Among all the other drill presses available in the market, the Rigid bench top drill press is influencing customers to a large extent and being considered as one of the best drill presses. For those who have large floor space and want to buy a large model should go for Rigid bench top model. These are more powerful than most of the types of drill presses and allows you to work with a heavy stock. Now, if you have already bought Rigid bench top drill press, you might have chosen it based on your clear perception of this drill press. But only buying is not enough; you should also need to know the assembly of the drill press as well. 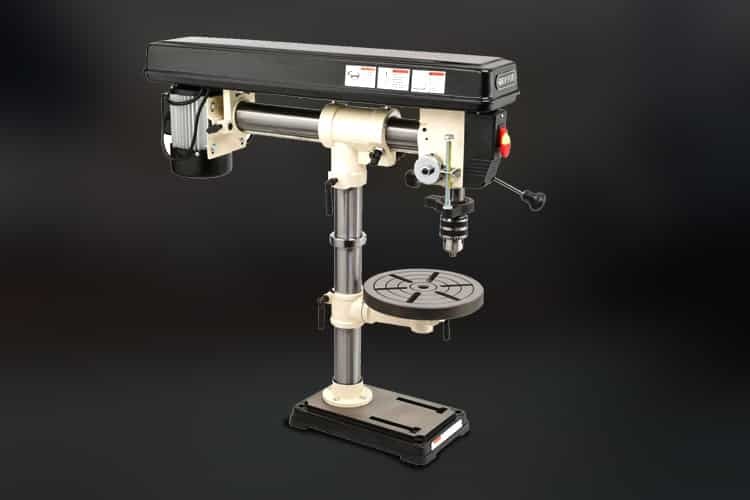 Rigid bench top drill press comes with an assembled head, but the chuck, handles, and belts need assembly. As the assembly progress, it becomes heavy eventually and may even require two people. Your first job is to unpack the drill press. The instructions are given on the top so that you will have no issue unpacking or assembling the tool. After you unpack, take the post and attach it to the base. As the press has too much oil on the post, you should wipe away all the oil and wax it afterward. You should clean the table post as well. So, wipe the oil off the table post using an oil-soaked paper and apply wax to it. If the oil remains, you can use a putty knife and scrape it off. The oil was used for a long boat ride to prevent rust. As the cleaning procedure is done, take the table and install the table in the table arm. The next step is putting drill head on a moving dolly and wheeling it over to the base. Now, tip the base and slide the drill head. Using your legs, lift and stand drill press up. You will not need another person for help if you use your leg doing so. This step requires installing the idler pulley and belts. After pulley and belt, install handles. You can choose the position depending on your habit. Most of the people install it on the right-hand side. But if you are a lefty, you can use left-hand side. Take a thick scrap and put it on the table. Wide open the chuck jaw and clean the mating surface of the shaft and the inner side of the chuck. Make sure to clean it nicely for keeping its stable position. Then, take the handle and press shaft in the chuck very tightly. There must be 60W bulb which is needed to be installed behind the handles in a small recess. If you do not find enough space to fit 60W bulb, you can press a CFL pigtail style up and reinstall the guard. The last step is to square your table to the quill. Combination table can also be taken in this case. It is required to use a bit which is straight and spins true. These are the steps you need to follow to get rigid bench top drill press assembled. Some of these instructions can also be applicable to other drill presses, but you should be careful while doing the job.